Paul Cook admitted Wigan Athletic’s 2-1 defeat at Millwall ‘swung on the penalty kicks’ just before the hour mark that saw the home side grab themselves a lifeline they went on to take full advantage of. Leading 1-0, thanks to a 45th-minute own goal from Jed Wallace, Latics were awarded a spot-kick on 57 minutes when James Vaughan was felled inside the box. Unfortunately, Josh Windass blasted miles over the bar to let the Lions off the hook. And the home side didn’t look a gift horse in the mouth, with Shaun Williams netting from the spot barely a minute later at the other end, after a foul by Reece James, before Steve Morison won it late on. “The game swung on the penalty kicks on the hour mark, but this is football and you have to move on,” mused Cook. “I thought Millwall were the best side in the first half, and to go into the break 1-0 up was very much a big plus for us because we didn’t deserve it. 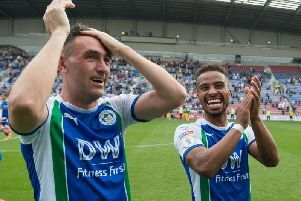 “But then at the beginning of the second half James Vaughan’s had a great chance, and the missed penalty is a massive turning point in the game. “To go 2-0 up, the whole atmosphere in the stadium changes completely. “A minute later, Millwall get a penalty, they score, and all of a sudden they’re totally in the ascendancy. “I think it would have been very harsh on Milllwall to have lost the game on the balance of play. Cook also defended his decision to make three changes to the side which beat high-flying West Brom at the weekend, including leaving star man Nick Powell on the bench. “It’s a tough schedule, and a few of the lads have been feeling as bit sore, a bit tight,” Cook revealed.